Vintage Racing Club of BC | The Zbarskys ‘Excellent Adventure’! 30 Mar The Zbarskys ‘Excellent Adventure’! 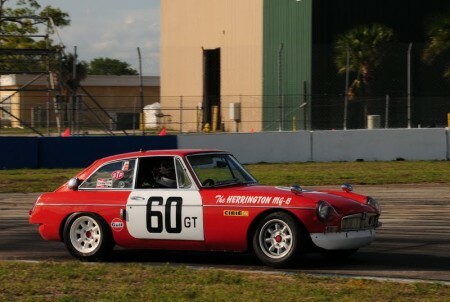 Well known MG devotees (and long time VRCBC members) Ralph and Michael Zbarsky have just completed a great trip to Sebring. This year Sebring celebrated the 60th Anniversary of the famous 12 Hours endurance race. As part of this celebration, the Sportscar Vintage Racing Association (SVRA) support race honoured the 50th Anniversary of the last MGA participation in the 12 Hours. A total of 19 different MGAs participated in the 12 Hours over the 1956 to 1962 period. Ten of those cars are known to have survived and eight of them were at Sebring this year. Michael raced their 1959 MGA Twin Cam roadster (#53) – maybe the last time a MGA Twin Cam will take the Green Flag / Chequered Flag combo at the Sebring track? And Ralph raced their 1967 MGB GT (#60). This former BMC Works Team car has some former ‘history’ at Sebring. (Check out this You Tube video of the 1970 race around the 2:20 mark!) Ralph must have retrieved that wheel because the car is beautifully restored now. See below. You can see an album with more photos of the Excellent Adventure here.